Following its very public condemnation of anti – patriotic art (case in point – Leviathan, Andrey Zvyagintsev’s Oscar – nominated film), the Russian Ministry of Culture has decided to put its money where its mouth is. This week, it has announced its long-standing project for building Centers for Innovative Culture, created to promote contemporary forms of art and culture in Russian regions, inefficient and unnecessary. 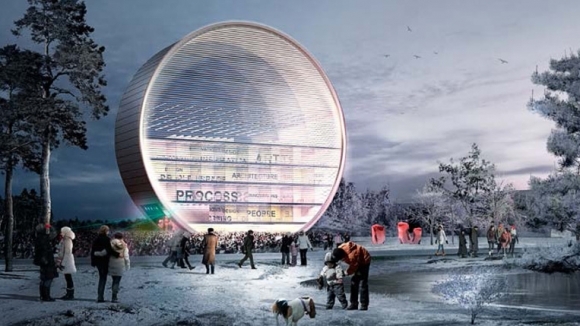 Architect Boris Bernaskoni’s project for the Innovative Culture Center in Pervouralsk. According to Izvestia, a Ministry committee has decided that the centers in Kaluga, Vladivostok and Pervouralsk will be re – branded as Regional Culture Centers and will switch their focus to ‘spiritual and patriotic enlightenment’ (which includes educational programs developed with the Russian Orthodox Church). The “innovative” project, initially created by Vladislav Surkov in 2012 as a 21st century analogue to the USSR’s Palaces of Culture, was envisioned as an educational initiative that would allow regional audiences to access the “most contemporary technologies in sculpture, painting and digital art.” The 1.25-billion ruble (roughly $18.9M) project was developed in close collaboration with Moscow’s Strelka Institute for Media, Architecture and Design. Two years later (and nearly half-way into the project’s budget), the official position towards culture has changed so radically that it makes Surkov look progressive. Film director Nikolai Burlyaev, a self-proclaimed “patriot” with strong homophobic views who is developing the new Regional Centers, claims that “there is no such thing” as innovative culture: “the previous concept for these centers was based on the idea of creating a new type of citizen, an agent of change, someone capable of political reform. Well, as we all know, that’s how Maidan started, and that’s what I told the Minister (Vladimir Medinsky)”. Ironically, Surkov himself was reported to be in Minsk with Vladimir Putin participating in the negotiation with Petro O. Proshenko, Angela Merkel and Francois Hollande. that is slated to decide the fate of post – Maidan Ukraine. Last Tuesday, in another move that left many puzzled, the Ministry of Culture announced the dismissal of Irina Lebedeva from the position of director of the State Tretyakov Gallery in Moscow, which she headed since 2009. Lebedeva will be replaced Zelphira Tregulova, who previously worked at the Museums of the Moscow Kremlin and ROSIZO exposition center. Apparently, Lebedeva, a prominent scholar of Russian avant – garde art, was deemed “managerially ineffective” in dealing with issues of “matters of organization, construction work and restoration”. Some sources link her departure to budgeting issues connected to the construction of a new building for the Tretyakov, planned to open in 2018-2020. Speaking of budgets: Vladimir Ovcharenko, Regina gallerist and Vladey auctioneer, has masterminded an auction format fit for Russia’s struggling economy. On February 17th, Ovcharenko will hold the first Vladey All For 100 auction with starting prices for all lots fixed at 100 Euro. Apparently, these days 100 Euros can get you a small canvas by Valery Chtak, Misha Most and Alexey Kallima, a wall piece by Irina Korina or even a small drawing by Georgiy Guryanov. According to The New York Times’report on the London auction week, however, Russians still have no problem dropping several million on a Malevich. The avant-garde artist’s self – portrait on paper was sold for £5.7 million at Sotheby’s to a dealer rumored to be buying on behalf of Roman Abramovich. That being said, the seller was also Russian, so who knows what all this means in the grand economic scheme of things. This entry was posted in London, Moscow and tagged Russian Ministry of Culture, Tretyakov Gallery, VLADEY, Vladimir Medinsky, Vladimir Obcharenko. Bookmark the permalink.